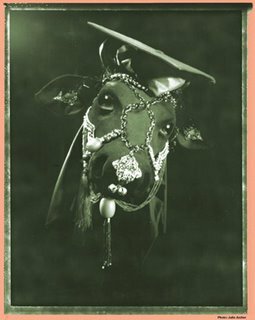 Mabou Mines presents avant-garde legend Lee Breuer’s Pataphysics Penyeach (a la Alfred Jarry), two one-acts: Summa Dramatica – a spiritual acting lesson, and Porco Morto – a memorial service for Gonzo Porco PhD, an avant-garde pig. Delivered as a lecture/postscript to William James’ “Varieties of Religious Experience,” Summa sends up and up and up into the ionosphere –“Acting-in-Itself.” A post-obit Porco comes back to life via a bunraku puppet. OBIE award winners Ruth Maleczech and Greg Mehrten star as a four-armed bovine Goddess, and as an old pot head pig who fell in love with The New York Times when he realized he had always wanted to screw the system.